You can have unique cuisine from Spain, India, Italy, and Germany right in your own home. Be inspired by these dishes made with ingredients from the supermarket! You don't always have to eat out to enjoy different cuisines. Put your culinary skills to use and add some exciting new elements to your dishes. Why not have a candlelit Italian dinner at home with your man? Or, why don't you surprise your girls with a Spanish brunch, cook up a hefty German supper for the whole family, or treat yourself to an Indian midnight snack? Find authentic imported food products from Italy, India, Spain, and Germany in Rustan's Supermarket from July to October 2011, and develop your own take on these foreign dishes. Cosmo got to sample delectable international dishes at Rustan's Supermarket's "Wonders of the World" culinary festival at The New World Hotel in Makati. We tried everything, from Italian pastas and Spanish paella, to Indian dumplings and good ol' German sausages. A lot of the dishes were nothing like we've ever tasted before, yet they were so good, we wished we could bring them home to our loved ones. The good news is, you can actually make dishes like these at home, with ingredients you can get in Rustan's Supermarket. The world of gustatory delights is now at our fingertips--in an array of delicious, high-quality, authentic products. Savor The Rich Taste of Italy--"Delizioso!" From now to July 20, Rustan's Supermarket offers an extensive lineup of delectable authentic Italian products. You can pick up Italian meats, breads, wines, pastas, sauces, herbs and spices, and even the country's most famous cheeses. Renowned chefs will be demonstrating their culinary expertise and giving practical tips for preparing authentic Italian fare in weekend in-store cooking demos at select Rustan's branches (there's one on July 9 in Rustan's Makati). You can load up on everything you need for a romantic, candlelit, authentic Italian dinner with your man. You can take a break from shopping and try the special Italian menu at Benny's Cafe, Rustan's Supermarket Makati, care of Chef Beth Romualdez. Who knows, you might get more ideas for what to cook. It's hard to truly enjoy Indian cooking when you don't even have the authentic ingredients for them. Now, you can find Indian cooking must-haves at Rustan's Indian Festival from July 22 to August 24. Rustan's Supermarket will offer a variety of spices and condiments, ingredients, and fresh produce to help you recreate some of India's most popular dishes at home. Taste the difference. Enjoy A Flamenco Of Spanish Flavor--"Sabroso!" Think you know Spanish food too well? Think again. Discover the varied culinary delights of Spain from August 26 to September 28 and see the difference authentic ingredients can make. Now one of Europe's rising gustatory hotspots, Spain's distinct selection of seafood, premium food items, and ingredients will be available in Rustan's to help get you immersed in the country's rich tastes. Treat Your Tastebuds To A Bit Of Germany--"Kostlich!" 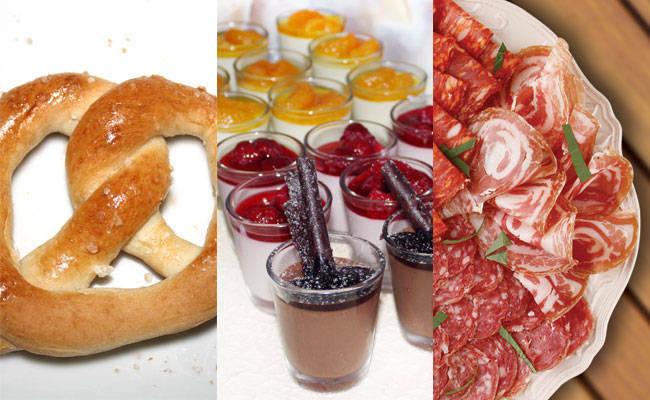 Stock up on German food stuffs in Rustan's Supermarket from September 30 to October 31. Beer, sausages, and everything in between will allow you to enjoy the famous annual celebration of Oktoberfest right at home with your family or barkada. Not such a pro in the kitchen? The supermarket is also giving away recipe books that feature each of the countries' well-loved dishes for a minimum accumulated purchase from July to October 2011. Click through the gallery to be inspired by a visual treat of the yummy dishes from Italy, India, Spain, and Germany, plus a few of the products currently available in Rustan's Supermarket! Rustan’s Supermarket has branches in Glorietta, Rockwell Power Plant Mall, Gateway Mall, Katipunan, San Antonio Plaza Arcade in Forbes Park, Greenbelt, Paseo de Magallanes, Corinthian Hills, Ayala Center Cebu, and Il Terrazzo Mall in Tomas Morato, Quezon City.